Sanitary Angle Seat Valve is applied in the industries of dairy, brewery, beverage, chemical, and pharmacy. It is operated by a single pneumatic actuator, select from either normally closed (NC) or normally open (NO) configurations. The design of sanitary angle seat valve is high sealing integrity, it is maintenance-free and robust valve. Wellgreen sanitary valves are good choice for the application of food,beverage,biopharm etc. Process enviornment friendly – design of angle seat valve. Large flux, low resistance and no water-hammer :Y-type shape enlarged the flowing section, which could raise the flux by 30% and make flow more smooth. Super long lifetime–The valve stem is AISI 316 with strong anti-corrosive ability. The PTFE seals are in wedge shape, which help the stem adjust and lubricate itself automatically. Advanced pilot cylinder–The cylinder material is stainless steel or thickened engineering plastic, lubricates automatically, maintenance free, and rolls freely 360 degree. Forged /investment casting valve body and disc to control the leakage and visual well. 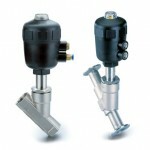 *For more information of santiary angle seat valve, please contact us for details.